(Pittsburgh, PA~ May 1, 2014) – The makers of Fun Slides® Carpet Skates™ and creators of the family fun and birthday centers sharing the same brand name are excited to announce the opening of their new flagship store in the N. Hills of Pittsburgh. 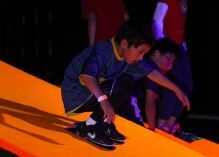 The newest Fun Slides Carpet Skatepark and Party Center will open May 31st for area families and thrill seekers to enjoy the area’s hottest new sports entertainment venue. Fun Slides, a multi-award-winning product from Simtec, Co., are plastic sliders that attach under athletic shoes. They provide the sensation of sliding on a hardwood floor with socks on. At Fun Slides Carpet Skatepark & Party Centers, kids and adults slide on the skatepark’s carpeted ramps, jumps and slide rails for an easy to learn thrill. The 33,000 square foot black light facility, located in the space under the Shop N Save in Pines Plaza Shopping Center is divided in sections based on skill level and every new skater, regardless of age or ability, is assigned an instructor for basic lessons. With ramps ranging in height from six foot tall down to short beginner ramps just about anyone can learn and have fun. The park also includes two regulation size dodgeball courts and also a Jr Slider Zone area used for skaters age 3-5 years old. The facilities are ideal for birthday parties and large groups up to 400 for school field trips, youth group activities, scouting events and corporate team building. 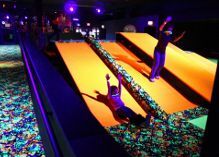 The Pittsburgh location offers three party rooms with three additional rooms in the fall that can be combined into one large area to celebrate with plenty of friends. The Fun Slides Carpet Skatepark & Party Center at the Pines Plaza Shopping Center 1130 Perry Highway opens for public skate sessions May 31st at 12:30 pm. They are now booking for birthday parties. Their website is www.funslidespark.com and phone number is 412-364-9400. SPECIAL OFFER: BOGO and/or Save on your Next Birthday Party! A family run company headquartered in Irwin, PA. They first hit the market withEZ Moves® Furniture Slides™. Founded in 1993 when a Penn Township father and son team of carpet installers knew there had to be an easier way to move furniture. EZ Moves inspired Fun Slides Carpet Skates and the development of a line of Fun Slides brand carpet sports products.